HOLE BY HOLE | PRACTICE AREA BECOME A MEMBER NOW! Newton Country Club has one of the best practice facilities in NJ! The driving range has natural grass tees and is wide enough to accommodate a dozen or more players. Golfers are able to hit a full range of clubs. The targets extend out to 225 yards. There is a beautiful practice putting green conveniently located between the Pro Shop and 1st tee. There is also a fabulous short game area where members can practice a variety of shots from up to 75 yards. There are 2 bunkers, rough, fairway, fringe, and a putting green to allow golfers to practice the entire short game. 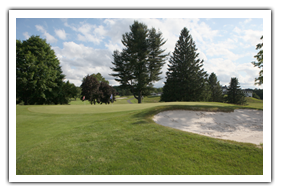 Individual and group golf lessons are available to members at The Newton Country Club, by appointment only, under the direction of the Club's outstanding PGA Profesional, Tom Staples.